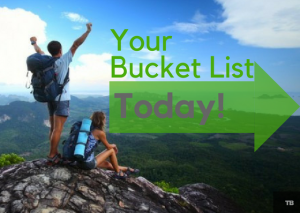 How would it feel to knock out your bucket list…..way before you kick the bucket? When someone thinks of a bucket list it is only natural to think well into the distant future. Treating these dream items as distant wishes. I’d like to prescribe to you that you can begin dipping into that bucket list today! Quite a while back I was fortunate to be invited into an elite study group. The study group consisted of many friends/peers who were leaders from around the country within the financial planning field. Our group, which was called Top Gun School, followed Dan Sullivan’s Strategic Coach Curriculum. If you aren’t familiar with Dan Sullivan or The Strategic Coach; I’d encourage you to make the investment in yourself. The investment is substantial however the return on investment is immeasurably life altering. There were numerous exercises and growth moments throughout the eighteen month course, however one session in particular has always stood out. The idea that your dreams are actually much closer than you realize. The exercise is quite simple. As with anything important its the execution that makes all the difference. We began by taking a couple of hours in solitude to list all that we wanted to accomplish in our lives. Categorically we segmented the list into short term, medium and longer term objectives. A bucket list of sorts. There was a realization that many items were well within reach in the near future when we simply prioritized our time and energy towards completion. It wasn’t long before we began sharing stories of monies raised, trips planned or simply the groundwork being laid out on some really big ideas. At Drive Planning we use the phrase (even hashtag) Be Intentional! The exercise that our Top Gun Group went through simply taught us to Live with Intention. Having an instructor, Kevin Murphey, whom we all looked up to and admired to hold us accountable certainly made a huge impact on each outcome. The best in any sport or field have coaches and mentors. I want to invite you to create that Bucket List and begin reeling it a bit closer each day, week or month. Find a mentor/coach to push you. If our Be Intentional Package will help you, well all the better. 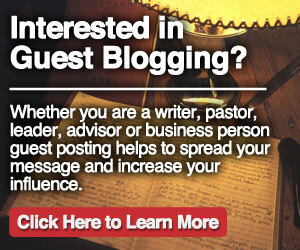 Does your network frequently discuss business opportunities or personal growth? If you answered No, the information below is likely for you! Recently, in a group setting, I made the statement above which brought several people up to me afterwards wanting to discuss this idea further. Later the image above was posted on twitter which triggered 3 text messages expressing interest and support for this message. I’ve believed this for a long time but these responses suggested that more and more people believed this also. For years I’ve had clients mention this to me; That they just didn’t know people who liked to talk business or ones that knew about investment opportunities. Have you ever heard the old adage, The Rich Get Richer? Of course, but maybe it isn’t solely about the fact that they have more money invested thus making money. In fact, I believe that its derived from this idea that who you know makes a significant difference in your wealth building. 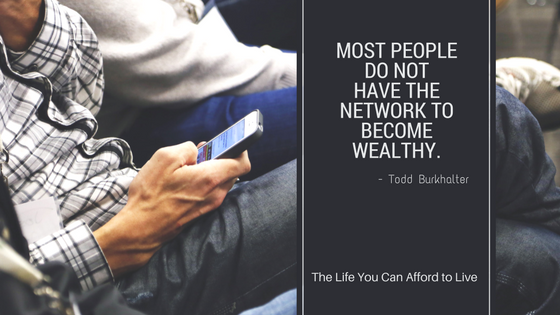 Robert Kiyosaki says, “your income will mirror your five closest friends.” So all of this information leads me to believe that we should pay close attention to our circles, conversations and information that we seek. I’d like to provide you with a few ideas that will give you an opportunity to begin developing a network that will help you to increase your knowledge and the value of your circles. When you Join as a Member of Drive Planning you gain access to investment deals, people and opportunities that you may not normally find. In addition to tapping into our network of advisors, information, knowledge and successful people you may also want to consider these ideas below. However, if you want to fast track your knowledge, network and opportunities consider joining Drive Planning and our customized approach for you. Contact me directly or reach out to memberservices@driveplanning.com for more information. If you’re ready to get started on a new path click here to begin! Follow me on twitter, LinkedIn and Facebook to continue the conversation. “Wow! That persons intense!” How many times have you heard that about someone? 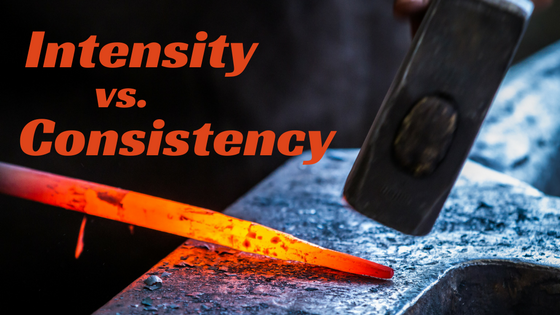 Being intense can be a phenomenal quality. However, In my unique business role I get to “see behind the curtain” of people’s relationships, health and finances. Over the past 20 years I’ve noticed that the intense person rarely has the best results. Consider this, you should brush your teeth at least 730 times per year. What if you said, I’m going to be super intense and take a really aggressive approach on this and you were able to knock out all 730 times within the first two months of the year? Would that work out? It’s pretty intense though. Intense people often talk about working out and being healthy. Many January Gym Members use their regiment as a point of shaming those who are less intense. However, what we all know to be true in the realm of healthy living is that its best when achieved over time. 20 minutes per day far exceeds the hyper intense 1x per week visit to the gym. Certainly I don’t want to give the impression that I’m an advocate for going slowly towards or meekly attacking ones goals. Quite the opposite in fact. However, in this time of year when New Years Resolutions are falling faster than Atlanta Sports Teams I want for you to consider creating life habits not just guilty fallout. Guilty fallout is the unresolved desires that you stack on top of last years failed or unresolved ambitions. Make certain, however, that you are creating the right or even best habits to achieve your goals. I often times see, regardless of intensity, people who are working on tasks or projects that will never lead them to their desired results. This is when having a mentor proves most beneficial; Most importantly being open to hearing and responding to their guidance and a willingness to change directions. As you get started with your 2018 plans consider techniques which will allow you to be more like the the tortoise from Aesop’s Fable. Steady plodding but all the while gaining on your goal. Check out Schedule Your Success or Automation to find some techniques that will assist in your journey. Because we all know that when you plan ahead things generally are more successful.